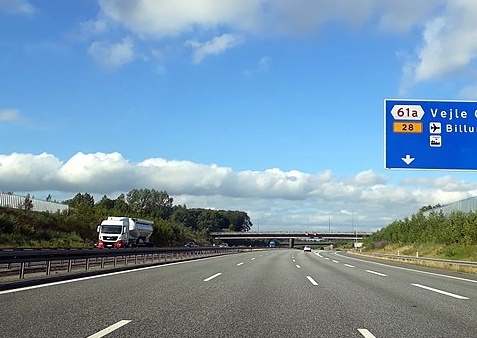 Yesterday, the E45 motorway in east Jutland was closed between junctions 56B at Hatting and 57 at Horsens S in both directions after stones were dropped from a motorway bridge earlier in the evening. Two cars were hit, but fortunately nobody was hurt, Sydøstjyllands Politi reported on Twitter. The cars were both struck by stones hitting their windscreens shortly after 19:00. “We received the first report at 19:15. The second driver was a bit rattled and continued on for a bit before he reported it to us, but both cars were hit at the same spot at around 19:15,” said duty officer Jesper Brian Jensen. The motorway was reopened shortly after 22:00. Last November, the justice minister, Søren Pape Poulsen, launched an initiative to install 30 surveillance cameras on bridges around the country in order to combat the spate of stone-dropping incidents on motorways, and the last ones were installed yesterday. It is not known whether the stretch of motorway in question is covered as for ‘tactical reasons’ the police will not divulge the precise locations of the cameras. Last September, a majority in Parliament indicated their backing for an initiative from the bank and building society organisation Finans Danmark to do away with large denomination banknotes. The measure is seen as an important step to combat money-laundering and is coupled with a suggested ban on 500 euro notes. As the first Danish bank to do so, Jyske Bank has just announced that it will shortly not be possible to withdraw 1,000 kroner notes from the bank’s terminals. The bank’s technicians have already started modifying the machines accordingly. It will, however, still be possible to deposit 1,000 kroner notes. The education and research minister, Tommy Ahlers, yesterday revealed that he plans to invest 300 million kroner in digital development that will be especially focused on artificial intelligence (AI), reports BT. “AI gives us a lot of possibilities for making both public services and private companies better and smarter,” said Ahlers. It is also important that the technology be developed in an ethical and responsible way. “We will insist on developing a Danish model whereby decisions are left up to a computer, and citizens will always be able to obtain the background information into how these decisions were made,” he added. Norlys, a proposed ‘supercompany’ created by the fusion of the two energy companies SE and Eniig, could provide electricity for around 30 percent of Danish households and deliver broadband to 42 percent of them, reports Energy Supply DK. If the mergers authority gives the go-ahead, Niels Duedahl from SE is tipped as the new administrative director. The concern will be headquartered in Silkeborg, with other offices in Aalborg, Esbjerg, Aarhus and Sønderborg. There will also be support functions situated round the country. Allison Kirkby, who was born in Scotland and has held previous top posts at companies such as Proctor & Gamble, Virgin Media and Tele2, has been appointed administrative director of the Danish telecom concern TDC, DR Nyheder reports. She will take up the post in December and be responsible for the company’s digital strategy, which involves increasing the focus on providing improved fibre optic broadband to customers and becoming the market leader in providing new high-speed 5G technology. Two new business units will be set up: one to expand Denmark’s digital infrastructure and support increasing digitalisation, while the other is a customer-based one to focus on developing innovative digital services.